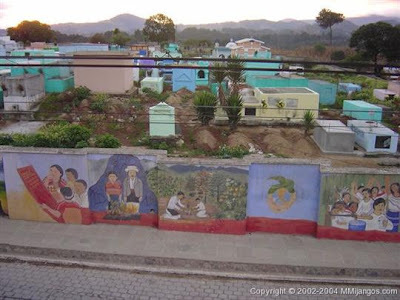 Certainly the artistic talent is innate to the residents of San Juan Comalapa, and all you have to do is look around to realize it. 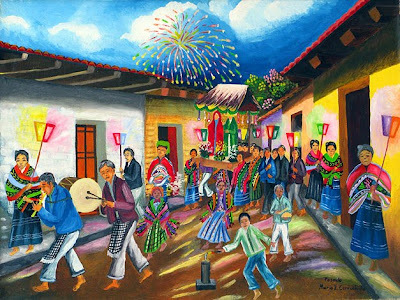 Beginning with the entrance to the town, where the first thing one can see are the walls that circulate the cemetery, all of them covered with vibrant murals depicting scenes of the daily life, costumes, and traditions of the region, following the style of the Master Painter Andres Curruchich, whose artistic legacy is alive through the hands and imagination of new generations of artists, including some of his grand children. Following the road to the center of the town, the facade of its outstanding church humbles the sight. To one side is the new temple built as a substitution of the first church that suffered serious damages during the earthquake of 1976. In front of it, there is a fresh produce market and the town's park, with its colored kiosk that reinforces the feeling of being in a land of artists. Paintings by Imelda Colat, on sale through Terra Experience. While at the park, one may admire some fabrics made by industrious women weaving, and also visit the former house of Maestro Rafael Alvarez Ovalle, author of the music of Guatemala's National Anthem. The anthem was written in response to a contest held in 1896; the first ever playing of the winning entry took place at the Colon Theater, the night of March 14, 1897, as one of the main events of the Central American Lyric and Literary Exposition, and the author of the music -Maestro Rafael Alvarez- was decorated with a gold medal and honor diploma. Comalapa has been distinguished as one of Guatemala's more artistic town. Therefore, it is not unusual to find families who remain united by means of the plastic arts and music. What about the food? Here I go again, thinking about the food I have eaten while traveling within Guatemala. 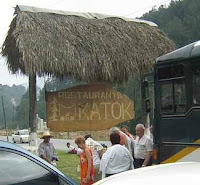 Those who know me already know where I am going to stop before our next destination: oh yes, Katok! The destination planned for tomorrow is Iximche, and to get there we have to go back to the Inter American Highway towards Tecpan and right on the side of the road, almost at the entrance to the town, there is this traditional restaurant, which has been in business since 1961. In Kaqchikel, K'atok means come in, and that is exactly what I would recommend, get in, sit down, order, and enjoy very good, succulent, comfort food. And for the road, let us buy some sauco (elderberry) jam, delicious! Qué hermoso blog para promover a Guatemala. La felicito por su trabajo y le agradezco la visita al mío. El ISBN es 978-968-496-660-4, acá en Guatemala lo vende el Fondo de Cultura Económica, tal vez allá en USA el FCE de San Diego, CA. se lo pueda conseguir. Gracias por la visita! Si no lo consigue escríbame a mi blog, se lo compro acá y se lo envío. Cuesta Q200 + el consabidos s&h. Estimado Leon: Muchas gracias por su comentario y también por el ISBN del Pop Wuj. Si no logro conseguirlo por aquí, tenga por seguro que se lo haré saber para que me eche una mano.